File photo shows Sgt. Gilbert Eagle Feather, Lakota from Rosebud, S.D., at the waist gun of his B-17 Flying Fortress, Dec. 24, 1943. The Smithsonian’s National Museum of the American Indian (NMAI) has announced the five finalists for the design of a National Native American Veterans Memorial, slated to open in Washington in 2020. 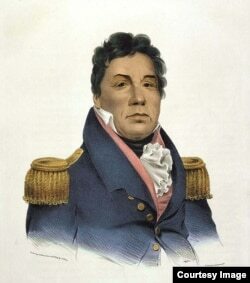 Portrait of Choctaw Chief Pushmataha, who sided with the Americans during the War of 1812. Courtesy, Smithsonian's National Portrait Gallery. During the Revolutionary War, members of several Native tribes living in Stockbridge, Massachusetts, served in a militia against the British. Choctaw, Creeks and Cherokee participated in the War of 1812 and in a series of “Indian wars” against other tribes and the 1840s war with Mexico. More than 28,000 Native Americans participated on both sides of the Civil War of the 1860s. 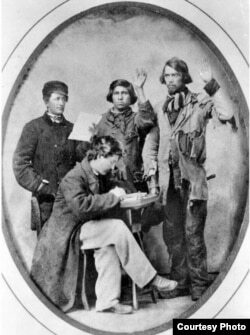 Two Union officials swearing in two Native American Civil War recruits. According to Bigford, the recruit on right may have been Adam Scherf of Stockbridge, Wisconsin. Courtesy: Wisconsin Historical Society. 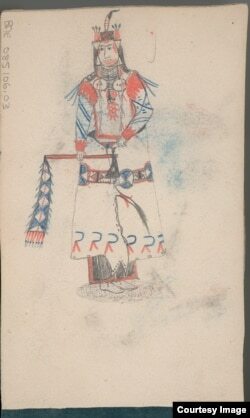 Ely S. Parker, a Tonawanda Seneca Indian from N.Y., the Union Civil War Brevet Brig. General who wrote the terms of surrender between the Union and the Confederate States of America. Photo by Matthew Brady. From 1866 to 1912, Native Americans served as Indian Scouts, aiding the U.S. Army in fighting and subjugating Western tribes. About 12,000 Native Americans served during World War I. More than 44,000 Native Americans served in World War II. 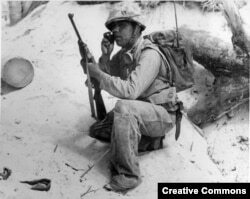 In World War II, Navajo soldiers used their language to transmit messages that could not be understood by the enemy; and in World War I, Choctaw soldiers used languages to communicate secret messages by telephone. 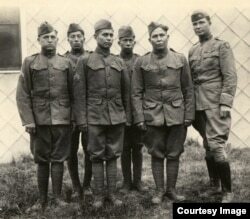 Choctaw Code Talkers in France during World War I. Photo courtesy of the U.S. Army. A Navajo Code Talker relays a message on a field radio. The code talkers served in the South Pacific during World War II and were kept a secret until 1968 when the code was finally declassified. More than 10,000 American Indians served during the Korean War. More than 42,000 American Indians served during the Vietnam era, between 1965 and 1975. 3,000 served in the Gulf War. As of 2017, there were more than 31,000 American Indian and Alaska Native men and women on active duty in Iraq, Afghanistan, and elsewhere. Native Americans serve at a higher rate per capita than any other ethnic group in the U.S., and this begs the question of why they would put their lives on the line for a government that historically oppressed them, consigned them to reservations and forced them to assimilate into the dominant white culture. Douglas Good Feather said the answer is rooted in spiritually and culturally significant warrior traditions. He is the executive director of the Lakota Way Healing Center in Mead, Colorado. It is a nonprofit group that draws on Lakota spirituality to help people heal from trauma and addiction. An Army veteran, he served two tours in Iraq. “In the old days, we had rites of passage,” he said. “They basically taught you there were different steps in your life and you changed with time. Rites of passage helped you from one age to the next. They gave you identity and helped you understand the next stage of your life. One of those rites of passage was to be accepted into the warrior societies. 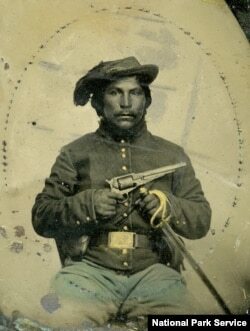 This undated photo shows an unidentified Native American soldier dressed in a Union uniform. Native Americans fought on both sides of the U.S. Civil War. More importantly, he stressed that Native Americans are patriotic. Oklahoma native Harvey Pratt, Cheyenne/Arapaho, is among the five artists whose designs for the Native Veterans memorial are under consideration. 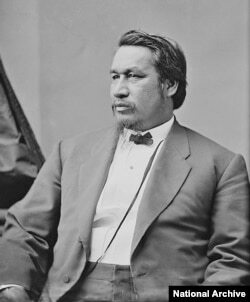 This photo by L.A. Huffman shows Pretty Nose, an Arapaho war chief believed to have fought in the Battle at Little Big Horn in which General George Armstrong was killed, just two years before this 1878 photo was taken at Fort Keogh, Montana. 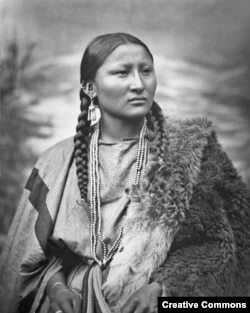 In point of fact, in many tribes, women served as warriors in the past, and today, Native American women enlist in greater numbers than Native American men. In Native communities today, warrior status is as revered as it was in history; every pow wow opens with a grand parade led by veterans carrying the U.S. flag to honor tribe members who have fought for their country, and memorials to veterans stand in many reservations today. Video (below) shows the grand entry of the 65th Annual Navajo Nation Fair, in Window Rock, Arizona, September 5, 2011. A national monument honoring Native veterans, said Pratt, is long overdue, and regardless of whatever design is selected, he said he is honored to have been part of this effort. The four other finalists are: James Dinh, Daniel SaSuWeh Jones (Ponca) and Enoch Kelly Haney (Seminole), Harvey Pratt (Cheyenne/Arapaho), Stefanie Rocknak, and Leroy Transfield (Maori: Ngai Tahu/Ngati Toa). The NMAI will announce the winner of the design competition July 4, the day America celebrates its independence.